Wizards and Football…Hold on, did you just mention two of my favourite things together? 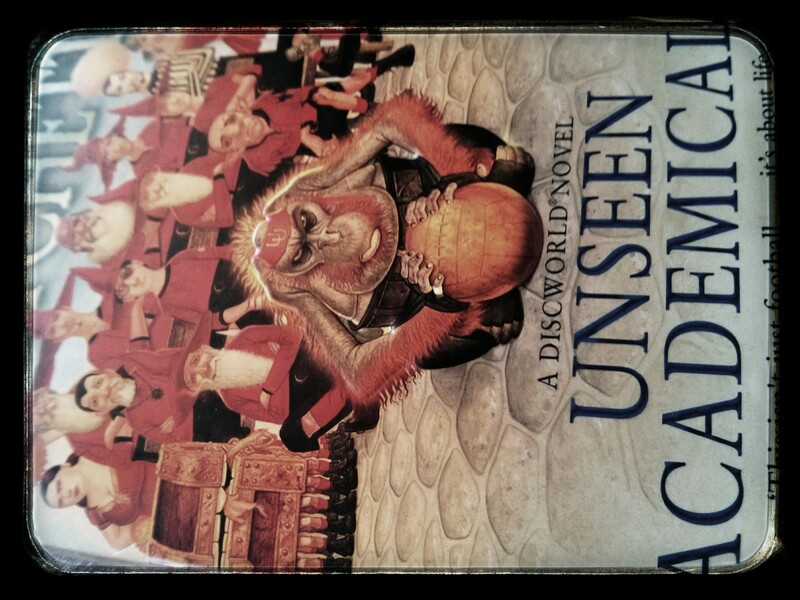 Unseen University and Football, Discworld and Football. I think my brain just melted a bit. That was my reaction when Unseen Academicals was released. Sadly my reading list was too large. But now I have finally gotten around to reading Terry Pratchett’s foray into the tug and war of foot-the-ball. Being upfront, I had very high expectations of this book. Did it meet those expectations? Short answer – no. However there was no way it could have ever done so. So I will pass my judgement with an open mind. All of the Discworld novels are entertaining. It is extremely rare to pick one up and not turn the pages with enjoyable ease. Unseen Academicals is no different. Give it a go, you most likely won’t regret it. To begin with, I thought there would be a lot more football in this book. And yes, the overarching premise is a revolution to Ankh Morpork’s ball game, to make it more closely resemble modern day football, yet there is more focus on a handful of characters working in the University. I found them genuinely likable for the most part. I wasn’t in love with them though. The story is tied into one of these characters in particular, Mr Nutt, who is an interesting fellow; polite, skilled and articulate. I liked Mr Nutt the most and will not go into revealing any of his secrets. I don’t want to spoil the book. Any part with him in it kept me interested and it was worth reading just to uncover more about him. I found the toughest parts to get through those focusing on Glenda; the tough, motherly night kitchen cook. She was a great character, but the end of the book had a lot of Glenda. I feel it would have been better served with a bit more football or focus on the actual Academics. My biggest criticism is an odd one, but it is the fact that the Librarian did not get enough of a cameo. I can understand that a character who cannot speak is a difficult one to write about in length, but this was the opportunity to do so! (An Orangutan for goodness sakes. The perfect goal keeper.) His participation in the actual football had so much potential, but was too brief to be memorable. That aside, Vetinari stands out once again. I don’t need to go on in length as to how well Pratchett writes this tyrannical man. And the side story, which sees Juliet, one of the University’s staff, modelling dwarf designer clothes, was an interesting change. More dwarf culture is never a bad thing. The sporting culture of Ankh Morpork was terrifically colourful, even if those colours were primarily sickly shades of browns, yellows and greens. You get a real sense of the common people milling together in the streets and those scenes stand out for me with vivid imagery. Overall this was more of a story about a few quirky individuals, which used the coming of proper football to the Discworld as a backdrop. A little part of me wonders, if the roles had been reversed and the actual game had been centre stage, with the drama of the University’s staff less prominent, would it have made for a better story. We will never know. But we will have enjoyed the book regardless! This entry was posted in Reviews and tagged Ankh-Morpork, Book reviews, books, Comedy, Discworld, Fantasy, Reading, Reviews, Terry Pratchett by blottingaway. Bookmark the permalink.